(Verso, print) signed in black ink, at upper center edge: "Rhea E. Garen"
(Verso, print) inscribed in black ink, at upper left, by Garen: "Tree / house Freese Rd. [space] Varna, NY 1993"
A large tree shelters--and at the same time overwhelms--a house. The lush greens of summer suffuse this scene, even as the brown leaves pasted in the second-story window recall the previous autumn. An obliquely viewed street sign in the foreground divides the house and introduces a cautionary note to the scene. While the tree provides summer shade, an adjoining woodpile suggests the approach of winter and the tree's ultimate fate. 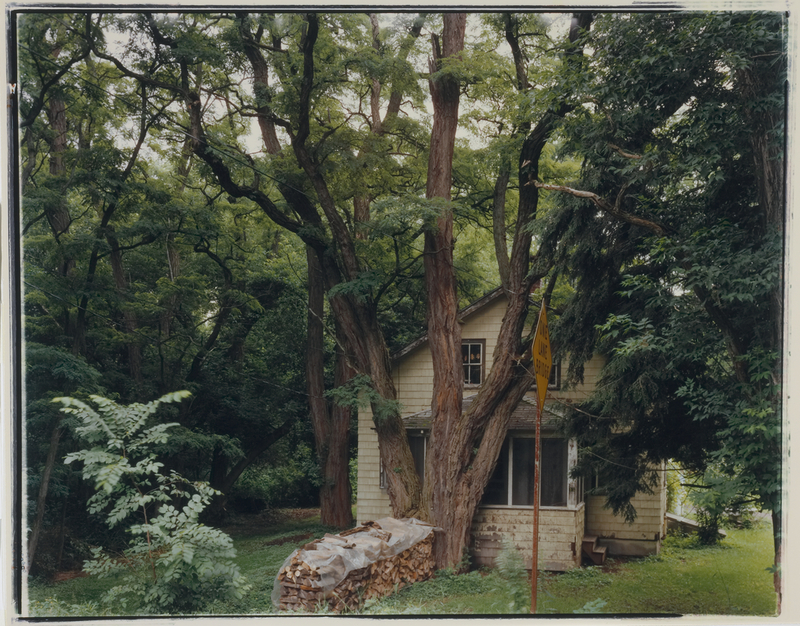 Rhea Garen photographed this house near a creek she passed by every day while walking her dog. Interested in the way a place changes with the seasons, Garen often returns to a site to photograph it at different times of the year. Nancy and Bruce Berman Los Angeles, CA, U.S.